Mar. 05, 2018 - Mothers will go to great lengths to protect their offspring. This sloth bear battled a tiger to keep her cub safe. India’s Tadoba National Park reaches blazing temperatures during the summer months. The heat and scarcity of water leads animals to assemble at common waterholes. Sharing these water sources can lead to vicious encounters like this. 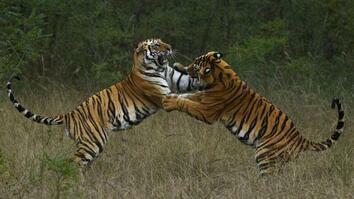 The fight began when the sloth bear and its cub approached where the tiger was drinking. The tiger immediately charged the bear when it reached the water. The fight went on for 15 minutes. Each animal is likely to have sustained notable injuries, but the sloth bear was able to protect its cub. Mothers will go to great lengths to protect their offspring. This sloth bear battled a tiger to keep her cub safe. 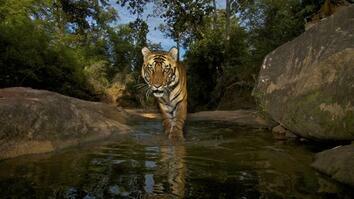 India’s Tadoba National Park reaches blazing temperatures during the summer months. The heat and scarcity of water leads animals to assemble at common waterholes. Sharing these water sources can lead to vicious encounters like this. The fight began when the sloth bear and its cub approached where the tiger was drinking. 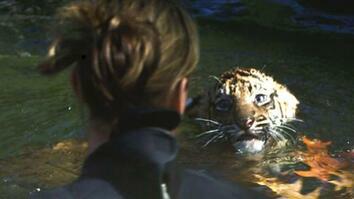 The tiger immediately charged the bear when it reached the water. The fight went on for 15 minutes. Each animal is likely to have sustained notable injuries, but the sloth bear was able to protect its cub.